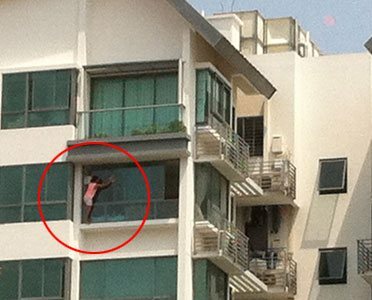 Another maid fell to her death in April 2012. She was the eighth this year. One employer got a safety belt for her domestic helper (shown here) to use while cleaning windows. SINGAPORE - Madam Gan Hui Leung, 46, has become the first to be convicted this year for failing to ensure the safety of her foreign domestic worker (FDW) who fell from height in Nov 2011 and subsequently died from her injuries. Gan was fined a maximum of $5,000. 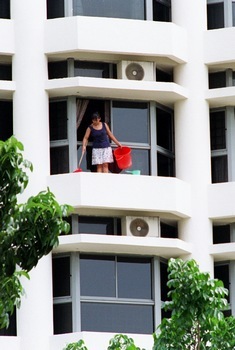 This is the first case involving a conviction of a maid employer for safety lapses in 2012. The Indonesian maid, Siti Ustima, 25, was employed by Gan from April 20, 2010 to November 11, 2011. 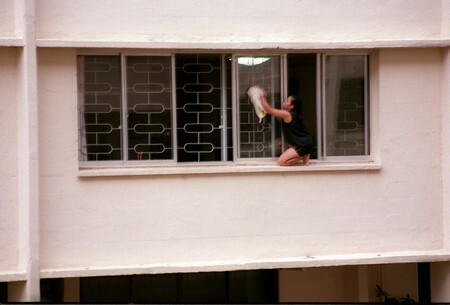 On the afternoon of November 11, 2011, Siti was cleaning the living room windows of Gan's fifth storey flat in Clementi. Shortly after, there was a loud noise and she was found lying on the ground floor. Siti died from multiple injuries. A wooden chair, a red plastic pail and a cleaning spray were later found next to the living room windows of the flat. Investigations revealed that during the employment of Siti Ustima, Gan did not demonstrate or give specific instructions to the FDW on how the windows should be cleaned. The employer assumed that Siti, who was transferred from another employer, would know how to do so. She had allowed Siti to stand on a stool with the windows and the grilles wide open when cleaning the bedroom and living room windows. She did not stop her from doing so, nor did she ask her to come down from the stool. 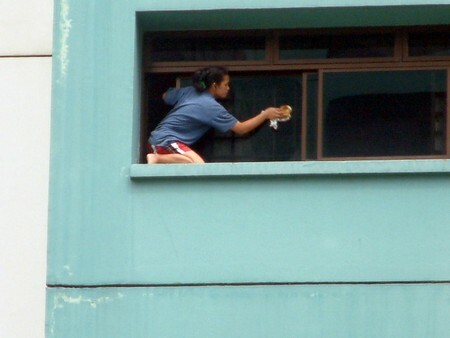 Gan also did not provide her maid with an extendable window wiper to clean hard-to-reach areas of the windows. Gan was found guilty of violating the Work Permit Conditions for the employment of foreign domestic workers, which is an offence under section 22(1)(a) of the Employment of Foreign Manpower Act. Employers who infringe these conditions can be fined up to $5,000 or face a jail term of up to six months or both. They will also be permanently barred from employing FDWs in future. Twenty-four FDWs have fallen to their deaths while at work from 2007 to 2011. Fourteen employers were found to have breached the Work Permit conditions for endangering the lives of their maids. Nine employers were prosecuted and fined up to $5,000, and were permanently barred from hiring maids. The remaining employers had their offences compounded. So far this year, there have been eight cases of fatal falls from foreign domestic workers while at work. Investigations are currently on-going for these cases. The Ministry of Manpower (MOM) urges employers to do their part in ensuring that their domestic workers continue to practise the workplace safety tips taught in the SIP. Employers who want to familiarise themselves with the safety dos and don'ts should refer to the FDW Employer Handy Guidebook.